What does it take to develop a community-based plan for climate change resilience with a bottom-up approach? The increased emphasis on adaptation by several international agencies, like the United Framework Convention on Climate Change (UNFCCC), has resulted in the active participation of the government and grassroots organisations in promoting adaptation. Though climate change has been in the spotlight for many years, it was not until recently that more emphasis was given to adaptation over mitigation. Being the need of the hour, adaptation, needs to replace the age-old "top-down" approach to mitigation with a community-based “bottom-up” approach. If investigated deeper, one can realise that with limited resources and dilapidated living conditions, the urban poor are among the among the most vulnerable communities to climate change. Employed in the city`s informal economy, the urban poor are mostly immigrants from different parts of the country looking for livelihood options. These people are poor without any job security and thus they end up living in unhygienic conditions. With the meagre amount of money and access to limited resources, the materials used for building their houses often leave them more prone to climatic risks. A day missed in employment-related activity results in a wage loss which affects their livelihood and, with climate adversities, it can add to their vulnerabilities. There is always a fear of eviction within the communities and even during floods, they often lose their goods and assets. Due to this unpredictability in their lives, they themselves do not want to spend money to improve their living conditions. In spite of all these difficulties, Mahila Housing Trust has taken the responsibility upon themselves to build the resilience of around 100 slum communities in the seven cities of South Asia with support from the Global Resilience Partnership Project. First, introducing the concepts of climate change through interactive sessions which include video shows, games and posters. The participants came to understand both the natural processes and anthropogenic processes that contribute to climate change. This also enabled a discussion of vulnerabilities they were facing in their daily life. Second, participatory assessments with the aim of collecting information that is rooted in the communities and in order to foment active participation. The intention was to develop the community’s capacity to start finding out about the risks and, from a planning perspective, to consider the urban poor not as helpless victims but rather as agents of change in building their own resilience. The basis of participatory assessments was to examine the vulnerabilities to current climate variability and extremes as well as to identify the current adaptation strategies with a gender-sensitive approach. The assessment was very helpful in understanding vulnerabilities and current strategies within the slum. Third, recognising the importance of the identified vulnerabilities and their relevance when planning for the future. A plan of activities based on seasonal changes (e.g cleaning the drains before the monsoon season starts to avoid floods) was facilitated. The planning process is to be based on identified vulnerabilities which can initiate the process of resilience building. The women were introduced to many climate resilient technologies which can be owned, financed through government funds and loans are provided for technologies to those in need. 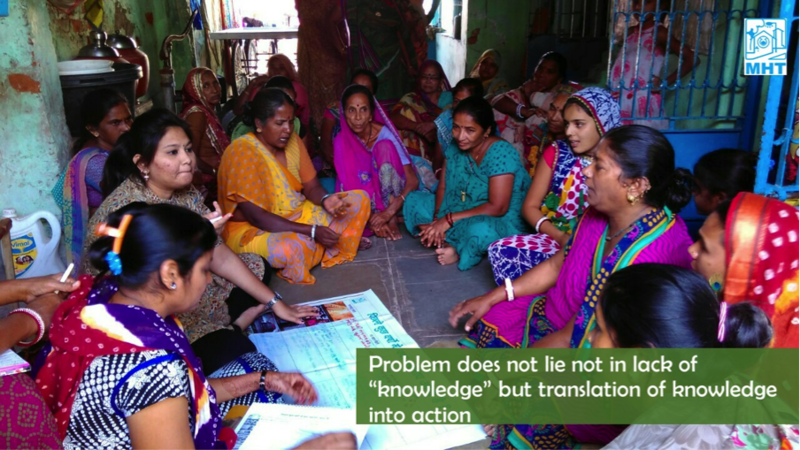 The women from the communities had never received basic elementary education, but they were nevertheless successful in conveying the message of climate resilience to their communities. This would also help them in taking future adaptation decisions. Resilience will always be in their minds.